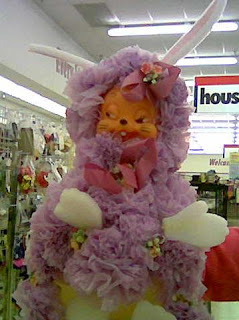 This posting is another installment in Weird Collections. It really should be called “Vintage Made-in-Japan Landscapes Composed of Bark, Cork, Moss and Paper on Painted Wood”, but that just doesn’t flow well. These pictures are mid-twentieth century tourist and export goods from Japan. They aren’t very well-regarded, but very little of what I collect would be designated “good” by most of the populace. That’s probably why I collect it, no one else wants it! There is only one picture that has a printed label; the label reads “Ucagoco Japan” and is gold and red foil with a Japanese symbol and stylized border. The rest of the pictures are stamped “Japan” in dark ink, and one also has some numbers next to the “Japan” mark. My frames are simple black, wood frames, with a layer of bark, then a cream-colored mitered flat board with an inner gold pained lip. I think my grandmother had one of these pictures, yes, the one who owned the flocked deer lamp: Oh Deer. I think the picture was in my parents’ house for a while, but this might be one of those pesky “false” memories. 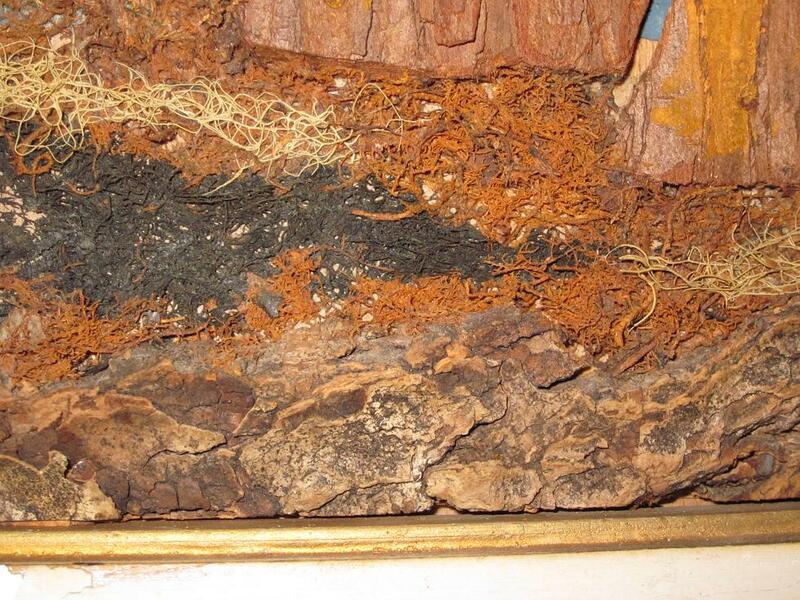 To continue, I love these pictures because of the “found” nature of their materials. At first glance, they appear to be something any school child could throw together as an art project. But upon further study, there is artistry in these creations that speaks of a higher level of sophistication. To begin with, they have perspective, which is a difficult thing to convey. They also demonstrate an artistic nicety when choosing which materials to use for rocky cliffs, as opposed to smoother granite cliffs. 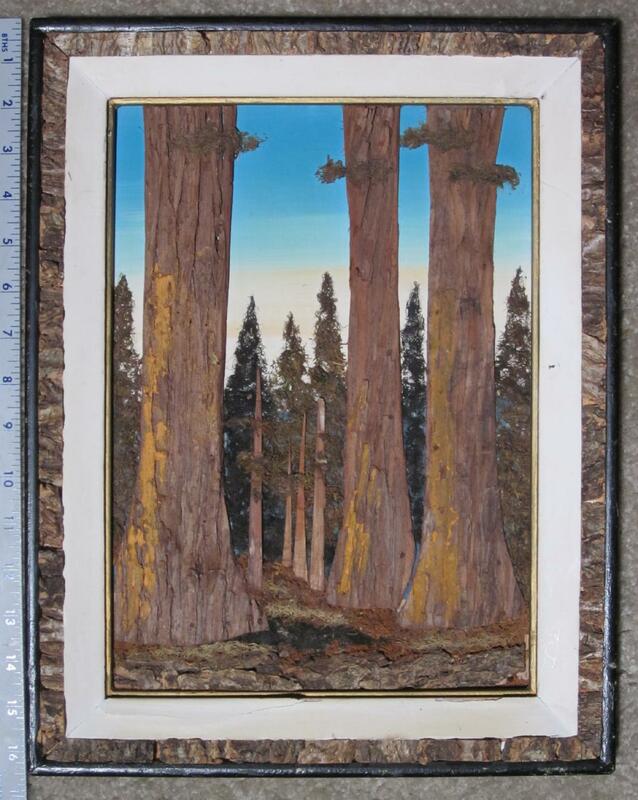 There is a sense of shading in the Sequoia picture—using different colors of bark makes it look as if there is light on the trees. Finally, they don’t have to try to convey depth because they have actual depth, depending on the materials used. The background painting is adequate, but certainly not the star of the show. I don’t have a lot of these, but if they are in decent shape, I pick them up wherever I find them. They are ephemeral; it doesn’t take too much rough treatment to reduce these pictures to something that resembles a jigsaw puzzle missing many pieces. 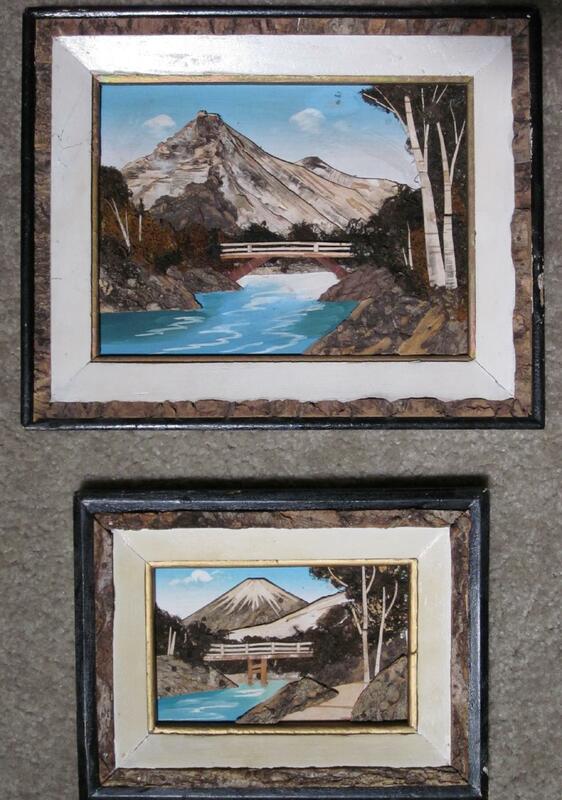 These first two pictures are mountain scenes and may be the most common type. I don’t know for sure, but I suspect that no two are exactly alike. They aren’t very large, the top one is about the size of a piece of paper (9″x11″). I’m including some close-ups because it’s tough to see exactly how these pictures are made from the above pictures. This next picture is very tall and narrow–21″ tall, which helps lead your eye down the river, and around the bends caused by the hillside. I’m very fond of the little house in the foreground perched precariously over the river. The people living there must be fishermen, or at least completely unconcerned about possible flooding. My beloved spouse doesn’t think that this picture looks like an Asian landscape, but that’s how it strikes me. The following picture is a gift from Kathy (the only thing we like as much as shopping, is shopping for each other! ); she found it at a garage sale which makes it perfect in my mind. The really interesting thing about this one is its subject matter. I’ve never seen one that wasn’t an Asian landscape; this picture resembles Sequoia National Park in Northern California, but that may just be me. 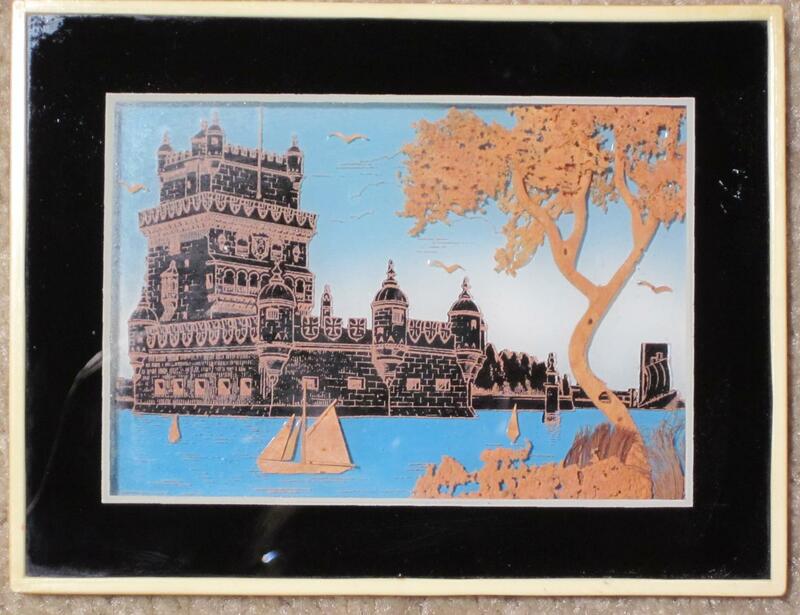 I also included a photo of my only cork picture, which was made in Lisbon. It has the same crafted-from-what’s-available nature, as well as a similar 3-D effect from the layering of material. The picture is made of cork on a painted background. Some of the cork has been blackened, and then scraped to create the intricate building. The frame is celluloid in appearance which is pretty cool. I’m not familiar with Lisbon, so not sure what is being portrayed; if anyone knows, please leave a comment. December 2015 Bill commented, “your cork picture from Lisbon is the tower of belem.” Thanks so very much for the knowledge! I have been hunting for these pictures for years. I recall growing up with one on our walls.Where and how much? Sharon, we don’t run into these Japanese bark and moss pictures very often; probably because they don’t survive rough handling very well. We usually find them at garage sales and thrift stores, and pay about $1-10 for them, depending on their size. If you aren’t a garage sale of thrift store person, you could go to a flea market and tell them what you want; the booth owners haunt garage sales and thrift stores and will eventually find one for you. Good Luck! Sharon, saw you post an we have about 30 of these wood,bark, and moss pictures. Got them from my husbands mother. We would sell a bunch of them if you are still interested. Lyn, do you still have any Japanese Bark pictures left? I might be interested. I can’t believe I found information regarding these three pictures I bought at a yard sale this weekend. I paid a $1 each. I was just intrigued by the use of materials and that it showed perspective. One has a bridge, the other a fence that is moving away from you and the other a cabin like house with a bridge. They are in good condition, only one I had to hunt outside for some bark to replace some missing pieces in the frame. Thanks for the information. Just a fun and different find and they look good at our cabin. Great buy for a $1 each! I occasionally have to apply a little more glue to keep the birch tree in place. If you ever hear anything else about them, please let us know! My husband retired this past year. His grandparents has two pictures like this on the wall when he was young. He has been collecting bark, mosses, etc… and would like to know what this type of art is called. Does anyone know? He would like to find more examples as he would like to try making something like this. He started with intarsia pictures a few years ago but would really like to try this. Anyone have some help? I’m really sorry, but I don’t know. I really like them, and my grandmother had one of these pictures too! They are definitely late ’40s or ’50s in aesthetics. I wonder if they are something that was encouraged as an export item after WWII. Since it’s mostly found materials, there is the potential for profit. 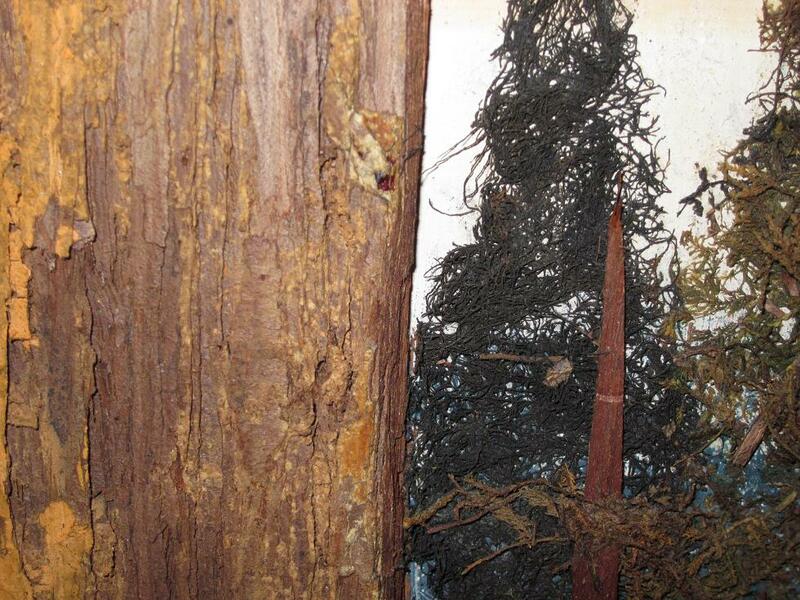 They are painted and glued to a piece of wood–plywood? If I was going to try to make some, I would have a scene sketched out in its entirety. Then you could paint the background, and finally glue moss and bark over the paint. One of my pictures is marked: Ucagoco Japan. They produced some ceramics and china after the war for the western market, but that doesn’t really prove anything. If you are able to find out anything else about them, I would be thrilled to hear it. This remains a very popular post for us, so if you would like to send a picture of the finished work, we would be happy to post it here on on Facebook. Wow, I collect these also, I have at least 50 of them,, soo cool! There are a few of us out there! I wish I knew more about them–do you? I find them really attractive and clever. I love these pictures ! I have one with a mountain and two of the ‘path thru the forest’. I am attempting to make one of my own. Love the rustic look of these pictures. Thanks Mary for the read. If you’re happy with how your picture comes out, please consider sharing a photo. I too find these pictures wonderful on many levels–the subject, how they are made, and when they were made! Wow, thanks for the info–it’s hard to find anything out about these bark pictures since they weren’t appreciated by collectors. I love them too! your cork picture from Lisbon is the tower of belem. I have 2 of these pictures I am willing to sale.If interested I will post pictures. Thanks Monica, but I’m not buying right now. However, Bonnie Hartwing (hartwigbonnie@gmail.com) commented here that she is interested in buying these kinds of picturers. You should contact her. Thanks for reading. Wow! amazing I can’t believe I *finally* found something online! !..I didn’t even realize they were Japanese! I’d thought they were Korean all this time, as my great uncle fought in the Korean War and we have several such relics from him, including two very similar such “relief paintings” as I’d been searching for. I was wondering if they were worth anything..?? It took quite a while to piece all this together with lots of the information coming from Bonnie Hartwig (hartwigbonnie@gmail.com) who was actively soliciting bark pictures from readers. I don’t think the pictures have much value; they are certainly delicate and being constructed of found materials make them more folk art than anything. When I find them they are always less than $20 and frequently around $5. As they become more rare due to their fragility, then they may go up in value. Thanks for finding us! I only knew that they were made in Japan, and I guessed in the 1950s. A woman named Bonnie Harwig posted the following in a comment in 2015: Hello fans of Japan bark pictures..I live in Washigton State and I too have a large collection from my grandmother and mother..and yes it’s in your blood…i find them too at the goodwill’s and at yard sales….but, very few out there……i do know they were made in 1942-45 in Japan…and where made during the WWII, to boost Japan’s Ecomony and i believe they may have been sold to the USA for war debt ….If any one else has more information about these wounderful pictures or would like to sell contact me at hartwigbonnie@gmail.com. ** And I still don’t know any more than that. I would like to see them. You can email picture to us at thesecondhandroses@gmail.com. You never know if you have one that no one has ever seen. They are all different because they were assembled by hand. I purchased a huge one of these pictures in a second hand store in California. It is in a shadowbox that is 18 inches high and 42 inches long. It really is a magnificent mountain piece. It appears to be Asian. We lugged this monster piece back to NJ in our Volvo and had to hire someone to hang it because it is so heavy. It took 3 guys to carry it upstairs in our home. We love the piece. However, it is way to heavy looking and cumbersome on our wall. I am going to take it down and sell it but I have no idea of the value. We paid $80.00!for it and I’m not even sure that I would get that much for it what do you think? I would try to sell it for $80 or best offer. There are local FB vintage selling groups, as well as craigslist; I don’t think that you can ship something that large. I still find them occasionally at thrift stores and estate sales. The place the seem to be most prevalent are antique/vintage malls. They are pretty fragile so after nearly 60-70 years, I imagine a lot of them just fell apart. Thanks for reading! We have one an uncle brought or sent back from Japan in the 1940’s as a gift to our grandmother. It is a picture of an ice capped mountain with a stream below it. In spite of the age, it is in excellent condition. From a non-smoking home. 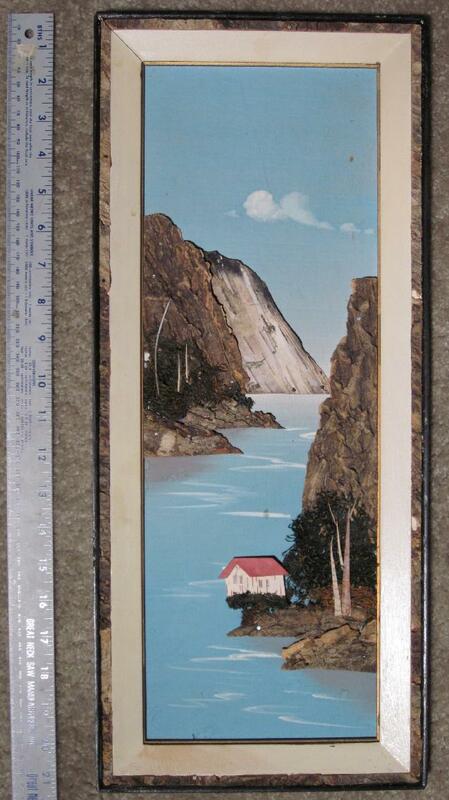 It is approximately 16″ wide x14″ tall framed. That is very interesting as i had thought they were for export only. These pictures are pretty fragile, so it’s a great thing to have in good condition, plus your picture is pretty big. I have 2 bark pictures. One was at my grandparents place the other in my childhood home. I’d love to collect more! I have three of these pictures for sale. They are 42″ wide by 24″ tall. Please let me know if you are interested and I will send pictures. Thanks!! I would love to see pictures, but I’m not in the market for buying them right now. If you look through the comments, there are a couple of people who have left email addys so they can be contacted by people selling. I think these pictures are so cool; wish they were worth more. I have just recently come into possession of three of these lovely bark, moss and paint Japanese landscapes.. One hung over the fireplace, and one hung over the dining room buffet in my childhood homes from 1957 until 1970. The third I believe belonged to my grandmother.. All three fell into the hands of my brother who recently died with me as his sole heir.. They were all originally acquired by my father who worked as a Communications Officer in the Merchant Marines (1948-1980) whose ships made frequent runs from San Francisco to Japan in the immediate two decades following World War II. Mine are 42 inches wide by 24 inches tall. I am getting ready to sell them on Craig’s List. If interested and for pictures contact me at sharyneck@comcast.net. If you read through the comments there are people listed who have left emails because they want to buy. I have about 10 of these in various sizes. I am amazed reading down through the comments how many some people have….that’s great!! I started with one from our family camp & then just kept adding over the years….love them so much!!! I agree that these pictures are attractive and unique. 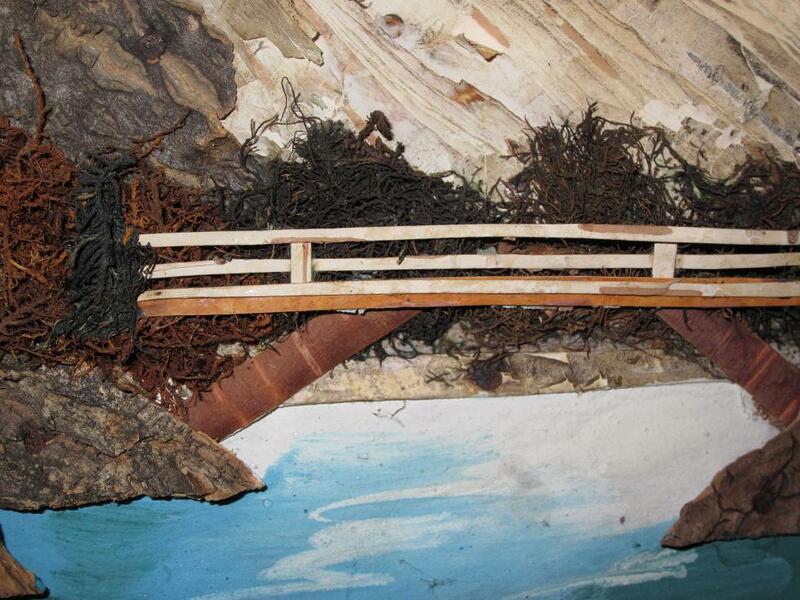 It’s those handmade touches that make mountain or river scene seem different. Sadly, we don’t find them all that often on our shopping trips. They are fragile, and all it would take is one serious fall from the wall to cause ruin.